The easiest, most delicious Beef Pot Roast that you make in your slow cooker! Only 7 ingredients are needed to make this incredible roast! I just want to put this out there… this happens to be the best roast that I have ever tasted. There I said it. What has taken me so long to make it? I have seen it going around on Pinterest for years but didn’t really pay attention to all of the hype, but then a reader on my Facebook page recommended that I try it. Check out my YOUTUBE video for easy to follow instructions. Follow me on YOUTUBE. Hubs said it was the best roast that he has ever had and asked me to make it again for a dinner party that weekend. Everyone just raved about it and asked me for the recipe. They were shocked when I told them what I used for the recipe. Don’t be scared about the stick of butter. this roast makes its own amazing gravy, so serve it over your favorite mashed potatoes. With just a few simple ingredients, you will find it to be so easy and mouthwatering. I couldn’t stop taking nibbles of it when it was done. I burnt my tongue, but it was worth it! I am salivating now just thinking about it! I found out where this recipe originated. It has gone viral and has been pinned over a million times! I can see why!! Hope you check out my video! It has been viewed over 53 Million Times! Only 7 ingredients are needed to make this tender, melt in your mouth roast! 3-pound chuck roast, Olive oil, 1 packet Ranch Dressing Mix, 1 packet Au Jus mix, pepperoncini peppers, and butter. 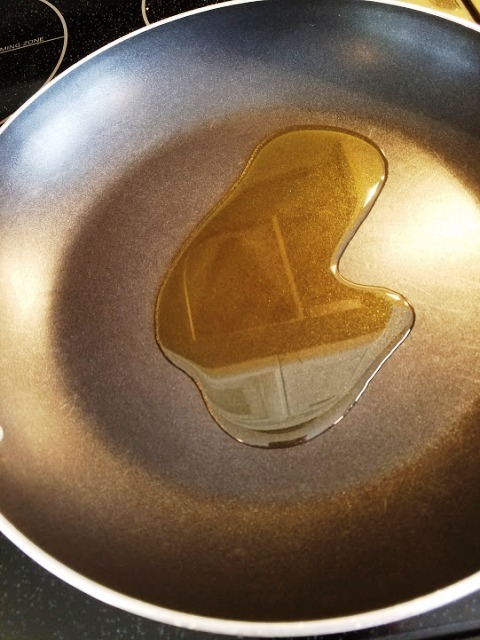 in a hot skillet, add olive oil. Season roast with pepper and sear in a hot skillet for a couple minutes. Turn the roast over after a couple minutes. Sear the other side. Take out 8 peppers from a jar. In a slow cooker, add roast, dry mixes, peppers, and butter. Cover and cook on LOW for 8 hours. Do Not Open Lid. With two forks, shred beef, remove fat. Serve this amazing roast over my favorite Mashed Potatoes Recipe. 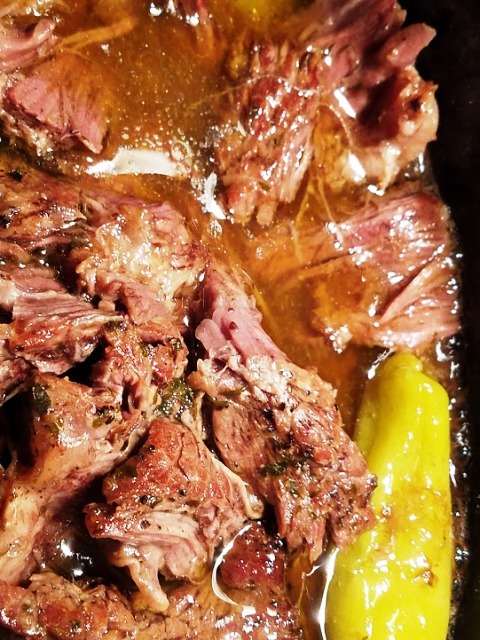 The best tender and flavorful slow cooker roast ever! Heat up a large non-stick pan on high. Season with a little bit of pepper. Sprinkle packets of dry ranch dressing and Au Jus over pot roast. Don’t be scared about the stick of butter. this roast makes its own amazing gravy, so serve it over my favorite mashed potatoes. 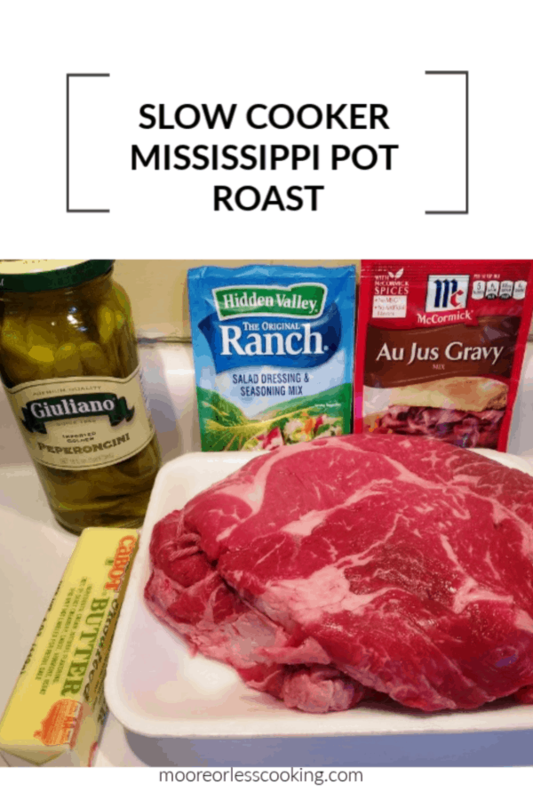 With just a few simple ingredients, you will find it to be so easy and mouthwatering and the best pot roast ever! Do you add the liquid from the peppers to this recipe or just the peppers themselves? Can’t wait to try this weekend! I didn’t add any liquid, the roast, peppers and butter make their own gravy. Enjoy! Can you add Mushrooms ? If you are going to add fresh mushrooms, I would add at the last hour of cooking time. I bought the sliced peppers is that ok to use and how much do I use if so? I do add the whole jar of peperoncino. It gives the gravy a wonderful taste! you are CORRECT! 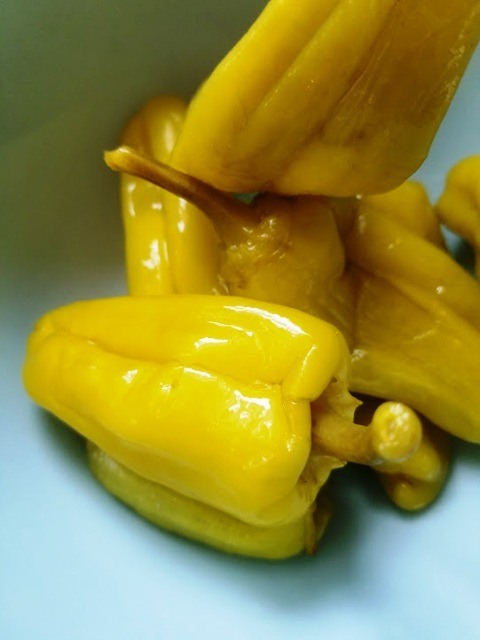 normally I do not even cook with these peppers…but I do add it along with the juice (half a jar) and it DOES add wonderful flavor to the gravy! YUMMO! OMG!!! I tried this recipe for the first time today, and it was just completely outstanding!!! I couldn’t believe my tastebuds!!! The meat was just so tender and full of flavor!!! This is how I’m going to cook my roast from now on!! Thank you so much!! I have a 2 pound eye of round roast I’d like to use to make this. Would I use a 1/2 packet of the dressing/aus jus mix and a 1/2 stick of butter? Could I do it in a dutch oven at 325 degrees (if so, for how long). If not, how long for a 2 pound eye of round roast in a slow cooker? Thanks! I think that would work great. I would bake it for 2-2 1/2 hours at that temp. in a slow cooker, I would cook it for 4 hours on low. Can you add carrots, celery and potatoes to the Mississippi pot roast? If you add them, do it in the last hour of cooking. Yes, that will work as well. 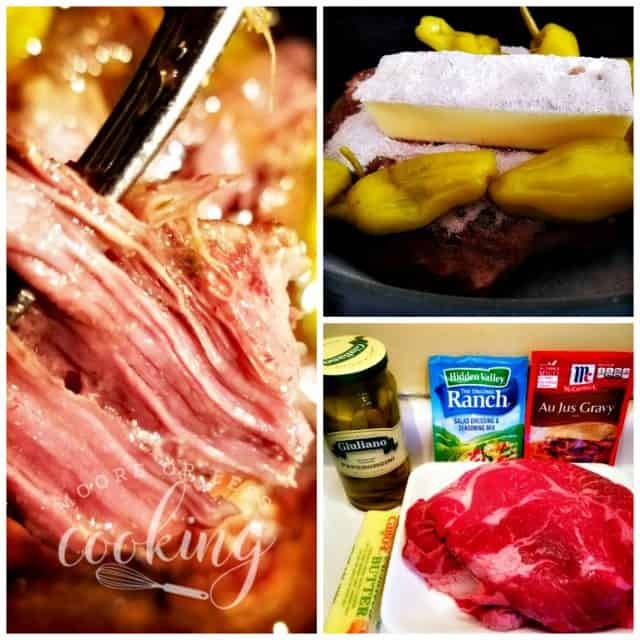 hi there, so late last summer i made this amazingly delicious pot roast… big hit… !!! 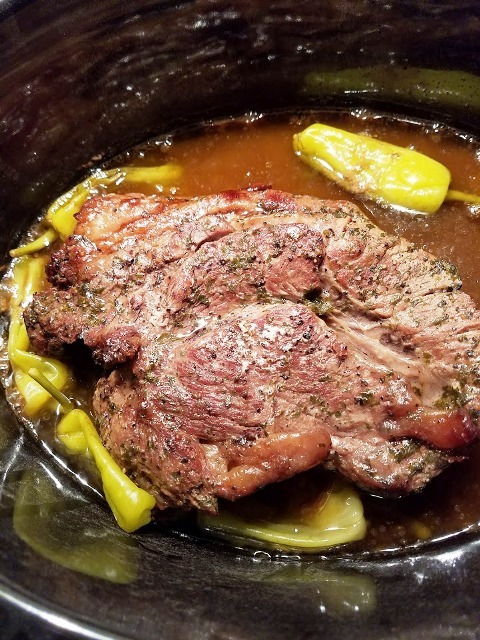 made it again yesterday, but had to move to my bigger crock pot, as the roast was a bit bigger… we don’t like peppers, so the first time i omitted them, and did the same last night… set it for 8 hours, and at 5:45 hrs. i smelled it burning…. 🙁 i checked and indeed it was burned… bummer!!!! 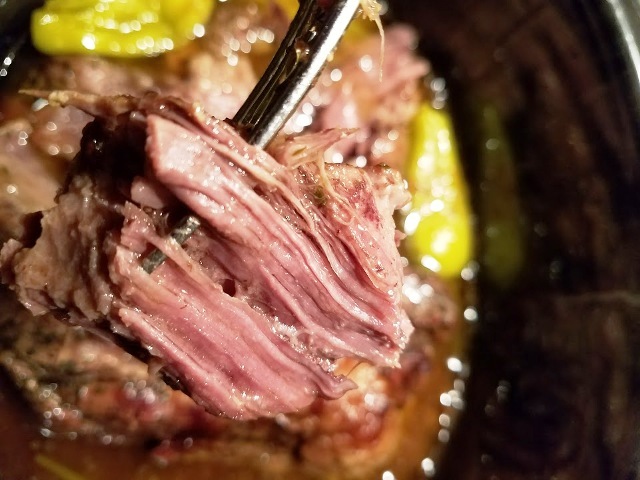 i’ve used this crock pot before with no problems, so i was stunned at what happened… the roast was almost totally lost…..i tried to cut off the 2 sides of burnt meat, but, not much was salvageable… and the roast had really shrunk in size by a lot! will make again, but will watch it carefully… but again, do you have any thoughts??? We have found that every crock pot cooks differently. What will cook perfect on low for 5 hours in one pot will be boiling after 2 hours in another one! Making this tomorrow! I just realized that I bought Ranch Dip not Ranch Dressing…. do you think there is much difference? Can I use the dip? Am so happy I came across this recipe. I’d been craving roast beef, mashed potatoes and gravy for a while and was going to do it the way I learned it from my mum…oven baking the roast, making the gravy from scratch from drippings, etc. Not only was this much tastier, it was also way easier too! I did make one substitution. Instead of the pepperoncini peppers, I used a 7 oz can of diced green chiles including the liquid…added a nice hint of heat to the gravy. Heather I used the DIP mix one time and it was still VERY tasty !!! Do the peppers make it real spicy? Looks and sounds delicious, it says 7 ingredients, I only see 6 am I missing something? 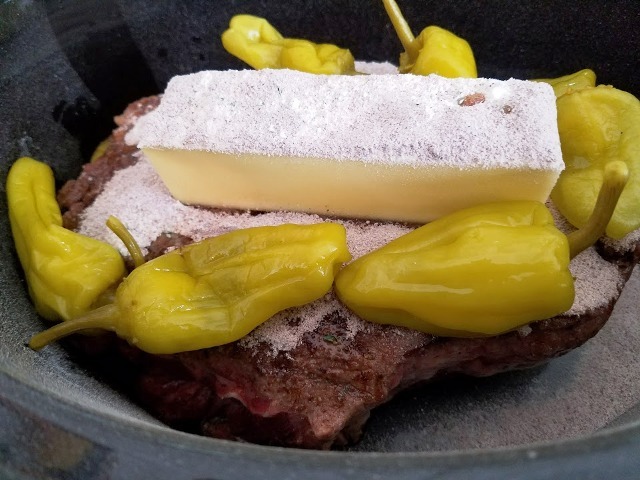 3-pound chuck roast, Olive oil, black pepper,1 packet Ranch Dressing Mix, 1 packet Au Jus mix, pepperoncini peppers, and butter. 7 ingredients. You can find Pepperoncini Peppers in the olive and peppers section in your local market or wholesale store. I have made something similar but this had a little bit of different ingredients so I thought I need to try it this way looks great and I’m just waiting for it to finish up at 8 p.m.
Other recipes like this call for the potatoes and carrots to go in about 2-3 hours before done otherwise they may disintegrate. Any one else able to attest to this? Thanks! Thanks Nettie for a great recipe. Absolutely the best Pot Roast we’ve ever had. Will definitely make this again. Just a little side note. I also added a sliced onion to it. Delicious!! Any idea if I can do this recipe in a Pressure cooker? I haven’t tried this recipe in a pressure cooker yet, let me know how it comes out! I have done it in a pressure cooker. It turned out great! I did add some water to it thou, about 1/2 to 1 cup of water. In reply to Sara Hull….Anything you do in a slow cooker, you can do in a pressure cooker much quicker.with great results. This recipe is absolutely wonderful. I had a dinner party and everyone loved it. Can I add potatoes to the crock pot and if so how and when do I add them? Made this tonight was good but it was a little to salty. Made mash potatoes. Mixed them together was better. Is Au Jus salty? Thanks for sharing. I didn’t think it was overly salty. Did you happen to add salt to the meat when you were searing it? This could be why? If I can’t find Au Ju Mix, will gravy mix work? You can find the Au Jus Mix next to the gravy mix. This is a favorite now for this household! Have made twice both times delicious! Question tho if i double recipe how much more time shoulkd I add to cooking? If you have room in your slow cooker, you can go ahead and double everything. My slow cooker doesn’t fit two roasts so I used two slow cookers. Looks so delicious & Easy. Going to try tis this weekend! Can I cook it in a dutch oven instead of the slow cooker? 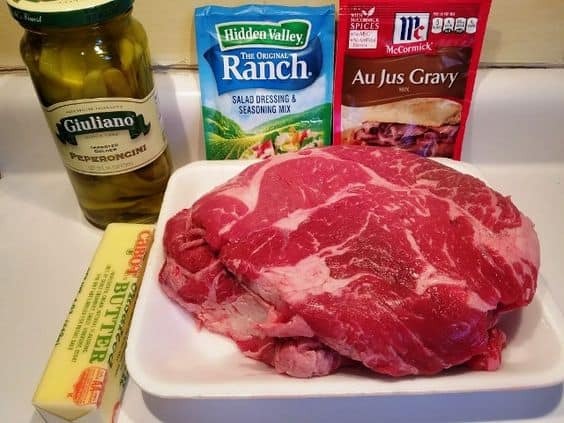 Would this work for a pork roast? I don’t care for hot/spicy food, does the peppers make it hot/spicy or just adds good flavor to the meat? It’s not hot and spicy, it adds amazing flavor to the meat. Can’t find the peppers 🙁 will it make a big difference if I leave them out????? I think that the peppers really add to the flavor, you could always add a different pepper if you have it, depending on how spicy that you like it, these aren’t really spicy. My sister made this for me when she came for a visit from Texas its absolutely by far the best roast I have ever had!!!! That said, it was definitely salty. 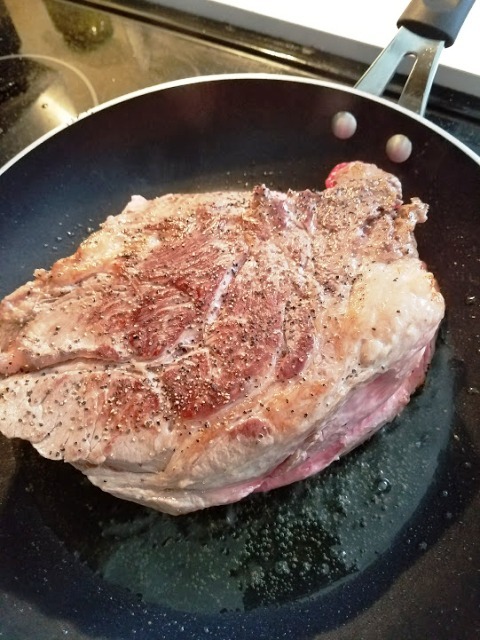 Not overly so, but I don’t know if my wife added salt to the chuck roast before searing. Next time we’ll add in some veggies for sure! I am so happy that you enjoyed this popular roast. Please don’t tell your Mom that Kyle, just invite her for dinner one night and make the roast, that way she will still cook for you! Add veggies and serve over potatoes, pasta or rice. I bought a ranch dip seasoning packet. Is this okay? I use unsalted butter and salted butter it just depends on how salty you like it. 5 Hours on High should work fine. When meat is seared, which means cooked at a high temperature over dry heat, it undergoes something called the Maillard reaction, which is a browning reaction. … Think of it as caramelizing the meat much in the same way that onions or sugars caramelize and change in flavor. Do you have to brown it before putting it in the crock pot? It is not a necessary step, but if you have the additional time, well worth it. Did you use a different cut of meat? The best cuts of meat for a slow cooker are Chuck and Round. The pieces of meat that work best in the slow cooker ― think pork shoulder or beef chuck ― are less expensive because they come from well-used muscles, meaning they’re naturally tougher. 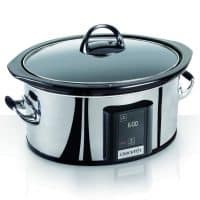 But the slow cooker takes the collagen, the protein that is responsible for making these meats tough, and melts it away over low, slow heat so that the cuts can become a fork-tender, melt-in-your-mouth meal. These cuts are also generally fattier, which ensures that they won’t dry out throughout the long cooking period. GREAT RECIPE , WILL BETRYING THIS SOON . Could I double this recipe in 1 crockpot for a large group? Sure! If it fits in your crockpot great! I have doubled the recipe using two different crockpots because mine wouldn’t hold two cuts of beef. This is the best thing that there is. Hi! Quick question….instead of the Chuck neighbors in the past would I be able to use eye of round roast? That’s all my grocery store has at the moment. If so, do i leave it on low for 8 hours in the crockpot still? Thank you in advance! That would work great as well. So it would still shred easy with the fork correct? Sorry one more question… which would work better as a substitute the eye of round roast or a bottom round roast? 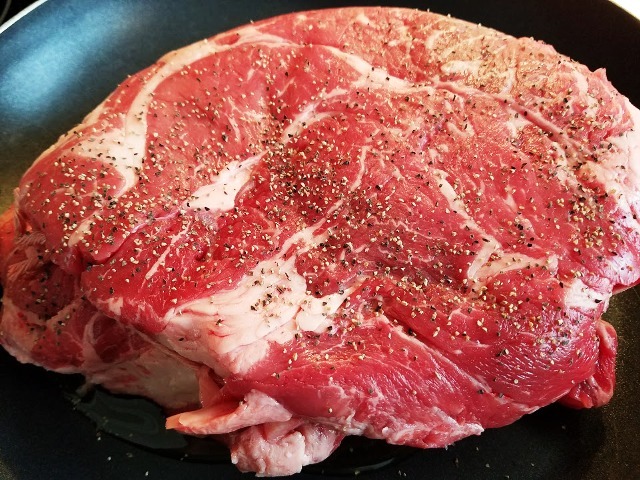 I only have one crock pot and a roast in it right now….I’d like to make another one but don’t have 8 hours how would I keep the other roast fresh well cooking this batch? And would 4 hours work on medium heat or would high be better? I have cooked the roast in a slow cooker on high for 4 hours, it worked out great. It’s in the pot and ready to go. I can’t wait to try it. Made this today! Omg!! It’s so yummy!! 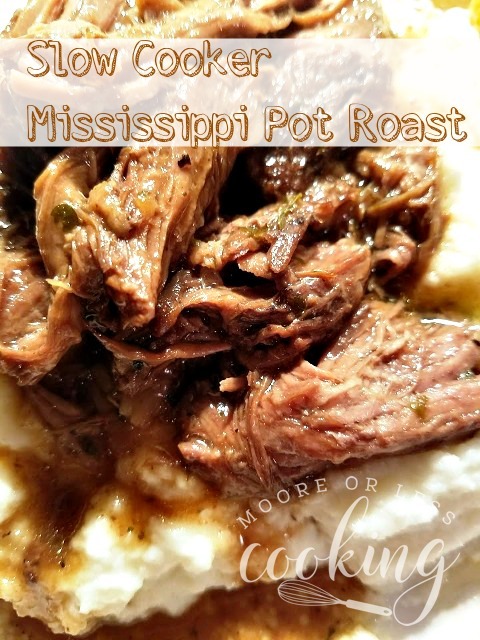 We are already planning on making 2 crockpots of this next time!! I am so happy that you enjoyed it Audra! Do you think browning the meat the night before needing it would be ok? I want to make it tomorrow morning but I won’t have the time in the morning to brown the roasts before adding to the crock pot. My husband made it without browning and it came out delicious. I have a rump roast. Will this work with a rump roast instead of a chuck roast? Rump roast should work just as well. Can I add potatoes in with the roast? If so, are there tips? Thank you!! I know that when I add potatoes in my slow cooker to stews or soups, I add them in at the last hour so that they don’t get mushy. Hope that helps! I this possible to make in the oven rather than a slow cooker? I just found out mine is not heating up and II have it all ready to go. It should work great, just check it to make sure that it has enough liquids. Do you suggest adding some water to the Au Jus gravy mix? Do i use fresh pepperoncini or Jar and use any of the liquid from jar ? What is 1 serving? 1 cup? 1/2 cup? 3/4 cup? 1/2 cup served over potatoes, rice or pasta. I am dairy intolerant, and recommendations for a substitute for the butter? You could try margarine or olive oil. I have made this recipe 3 times. The first time I made it, it was fantastic. The next two times, it was so salty I couldn’t eat it. I am wondering if I grabbed an unsalted stick of butter the first time. I even cut down the package of Au Jus mix to half and the package of Ranch Dressing mix to half to see if that helped but it didn’t when I used salted butter. So after reading these comments, I may try it once more with unsalted butter because the flavor (besides the saltiness) is fantastic! Maybe the Au Jus and Ranch Mixes were generic, which may be saltier than the original packets. Unsalted butter should help.